If you’ve been to a few hacker camps then you’re aware they are not the products of giant corporate entities but volunteer run community groups. You may even have volunteered yourself, and done all sorts of interesting tasks that go towards the running of the camp. But few of you will have been on the orga team of a camp, the people who put in the hard work of making it happen from start to finish. 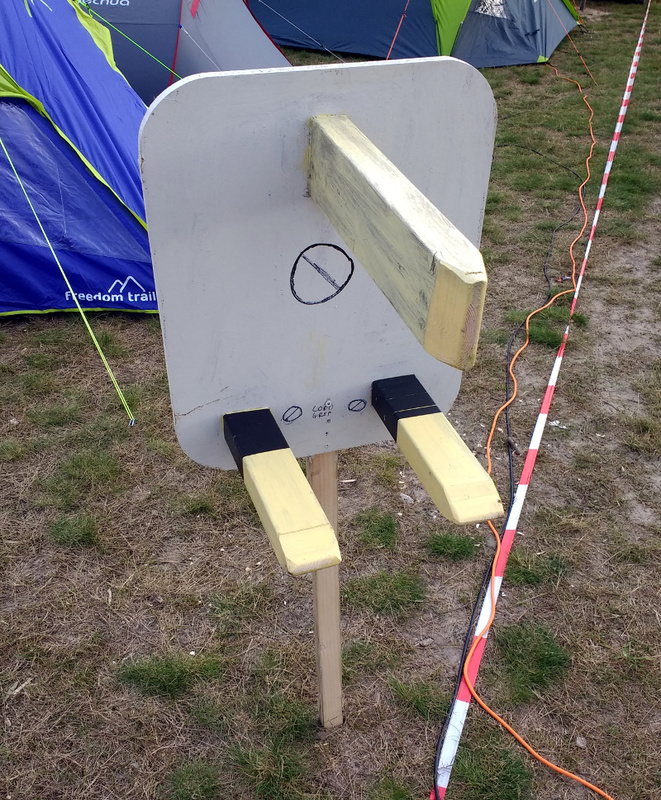 Julius ter Pelkwijk has, and at the 2018 Electromagnetic Field camp in the UK he gave us an insight into the experience. Of course, Julius isn’t a member of the EMF orga, instead the camp that gave him the experience was last year’s SHA2017 in the Netherlands. This was over twice the size of EMF 2018, on the Dutch polder at Scoutinglandgoed Zeewolde, a scout camp in a forest next to a dyke, and while from our perspective it was a huge success, it was fascinating to pull back the curtain and hear from the other side of the event. That Decentralised Low Voltage Local DC Power Grid, How Did It Do? There are a series of stages to coming down from a festival. After the hectic rush of travel there are the several days of catching up on lost sleep and picking up the threads of your life again, then once a semblance of order has been regained there’s that few weeks of emptiness. Your life will never be the same again, it’s all so mundane. I’m pleased to say the Hackaday and Tindie stickers were very popular. 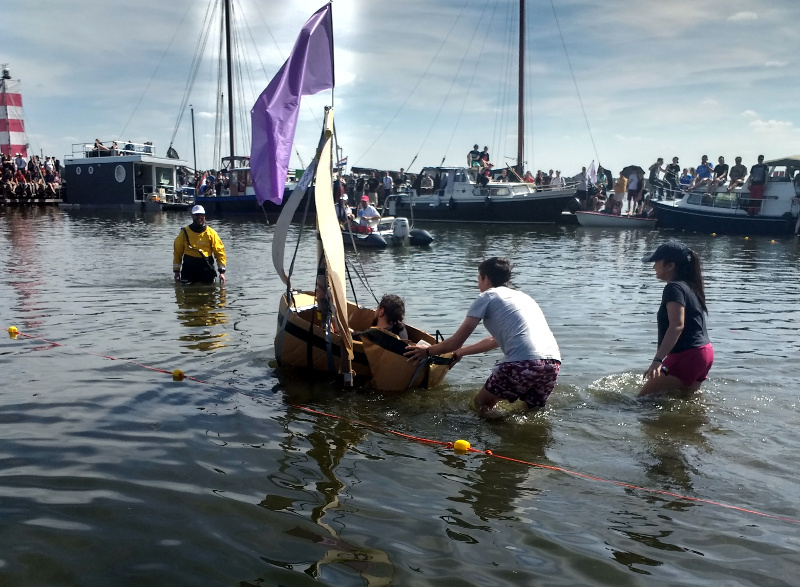 It’s now a couple of weeks since the SHACamp 2017 hacker festival in the Netherlands was in full swing, and the write-up below has slowly taken shape over that time amid the other work of being a Hackaday scribe and editor. It’s early morning here in Southern England as I write this, so on the equivalent day while I was at SHACamp at this time I would have been carrying a large pack of stickers for distribution on the swapping table through the rising sunlight of a camp still largely asleep after the previous night’s revelry. Past our German and Dutch immediate neighbours, down the ramp from the dyke, the cardboard tent depot on my left and the food court on my right, to the information tent. Greet the bleary-eyed volunteer at the end of their graveyard shift, and spread plenty of Hackaday and Tindie stickers on the table for the masses. And then? Find a coffee, and sally forth into the field for another day among one of the most stimulating communities on Earth. My community. Your community. 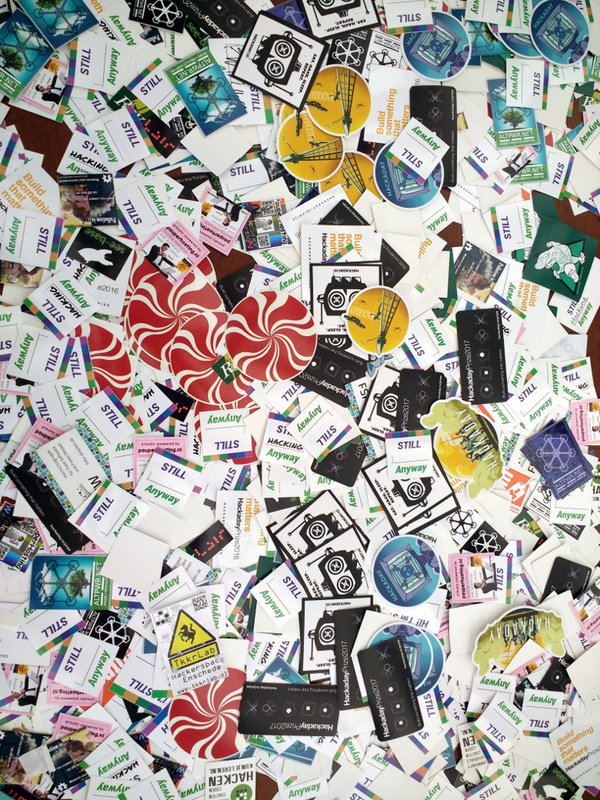 The sticker table is a good place to start if you wish to get a handle on a large hacker camp. On it you will find the logos of a cross-section of the diverse organisations and groups present. 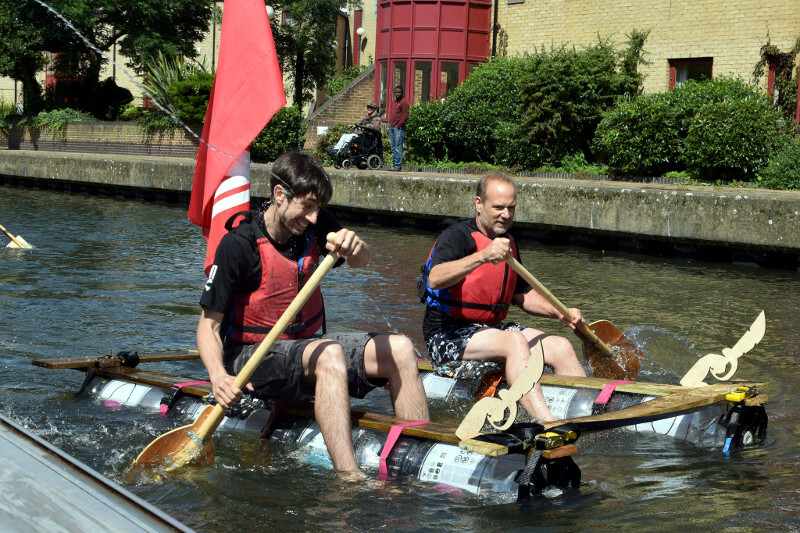 There are a few commercial ones like my Jolly Wrenchers and Tindie the puppy, there are some from voluntary organisations or interest groups, but mostly they are the logos of a continent’s — even the wider world’s in some cases — hackspaces and makerspaces. Here you see the breadth of the attendees, as the logos of spaces from thousands of miles away you’ve never encountered before mingle. This isn’t quite a global gathering, but there is a sense of global community around it. How Do You Describe a Hacker Camp? You shall find us by our clearly superior yet dangerous to barefoot pedestrians fused right-angled mains connector. So before I take you through my experience of SHA, it’s best to start by describing a hacker camp in more general terms. When I’m describing a camp like SHA to the kind of people who don’t read Hackaday, I put it as similar to the music festivals they are used to but without the bands. Instead the audience provides the entertainment through the work they bring to the event or do at the event, and through a comprehensive program of talks and lectures. Oh — and this is the bit that makes their eyes open wide — every structure on site from the smallest one-man tent to the largest marquee has mains power and high-speed Internet. Sometimes people grasp what SHA is from this description, sometimes they don’t. Different groups, be they individual hackspaces, people from a particular country, or other special interest groups, congregate in villages, collections of tents, marquees, and gazebos in which they set up whatever cool stuff they’ve brought along. My tent with its Hackaday flag was in a village composed of a mix of British hackspaces up on the dyke, which [Michael] from MK Makerspace had marked with a sign consisting of a huge BS1363A mains plug. More than one person pointed out it would have been better lying flat on the ground with pins in the air, ready to catch an unwary Monty Python foot. What do you do when your keenly anticipated hacker camp releases details of its upcoming badge and you really want to have a go at coding for it, but there are no badges for you to try yet? If you are [Artdanion], this is not a problem, you simply build your own. He found his requirement to interface with genuine hardware exceeded the abilities of the emulator that the SHACamp 2017 badge team had thoughtfully provided, so he reached for breakout boards for the ESP32, the MPR121 touch sensor, and the e-ink display, and assembled his own clone on a piece of stripboard. Not only did it provide him with enough to develop his own apps, he found when he brought it to the event that the public release of the official firmware ran on it with only a few configuration tweaks. He had an official event badge, that wasn’t the event badge. Is this the first time this has been done? We think it might be. The home-made badge is an impressive piece of work, but it ties into an observation we made at the end of our review of the official version of the SHA2017 badge. The use of an ESP32 with well-designed peripherals and a solid firmware means that this is a design that is likely to form the bedrock upon which some future badges are built. [Artdanion] has proved how straightforward it is to clone, we’d like to be so bold as to make the prediction that we’ll see more developments of this platform at future events. Meanwhile this home-made badge is a neat achievement, and we can only imagine the surprise of the SHA2017 badge team on being presented with a clone of their work for reflashing. The badge has become one of the defining features of a modern hacker camp, a wearable electronic device that serves as both event computer and platform for some mild software and hardware hacking. Some events have had astoundingly sophisticated badges while others are more simple affairs, and the phenomenon has even spawned an ecosystem of unofficial badges which have nothing to do with the event in question. The SHACamp 2017 badge is the latest to come the way of a Hackaday writer, and certainly contains enough to be taken as representative of the state of hacker camp badges in 2017. It doesn’t have a star turn like CCCCamp 2015’s software defined radio, instead it’s an extremely handy little computer in its own right.